APW-5 is a Mid-Low range enhenced traditional Inductor-Transistor type Wah Pedal. Most Wah Pedals need the replacement of pot, but APW-5 is applied to MAGNETIC FIELD SENSING SYSTEM, so it is NO POT-NOISE and MAINTENANCE FREE. You can control the Tone range of Wah with Range-Knob. 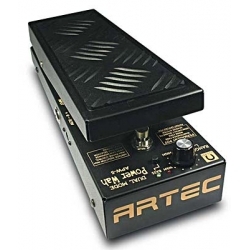 It is also used for Bass Guitar by Down Shift of Tone Range using Bass Switch.